I can eat all five mango. None of the friends have come to the party. I meet him during lunch last week. My friend has already left when I reached the mall. …a dismal 25% candidates understand usage of basic grammar constructs, like right use of articles and tenses. According to the report, lack of grammar skills is the third biggest problem in spoken English after fluency and pronunciation. 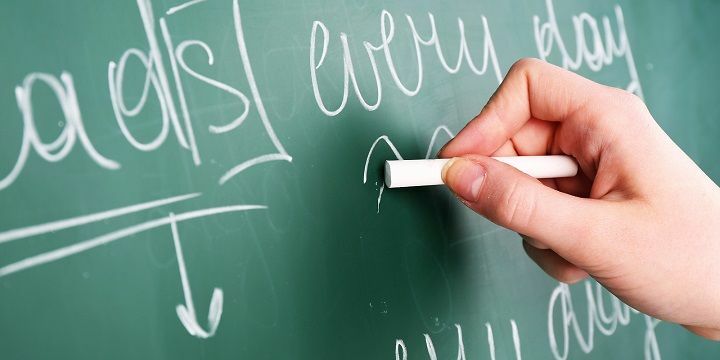 Only 18.7% candidates have reasonably good grammar skills. There are four tenses – simple, continuous, perfect, and perfect continuous. Each of them has present, past, and future forms, resulting in 12 variations in all. However, in conversations you rarely use more than a handful of these 12. Therefore, to keep it simple and not bog you down with too many variations, I’ll cover only those which are used the most (probably to the extent of 95+ percent). Simple present tense is used to describe a habit or a general truth. Simple past tense is used to describe an event that started and finished in the past. I walked in the park on Sunday evening. The action of walking started in the past (say at 6 PM, Sunday) and finished too in the past (say 6:30 PM, Sunday). The red line above depicts the event in the past. The key here is the finish (red dot), which happened in the past. 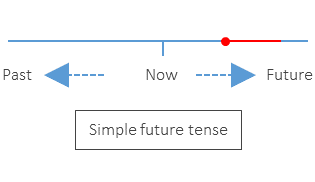 Simple future tense describes an action you’ll do in future. I will walk in the park tomorrow evening. The action of walking will start in future (say at 6 PM, tomorrow) and, obviously, finish too in future (say 6:30 PM, tomorrow). The red line above depicts the event in future. The key here is the starting point (red dot), which will happen in future. 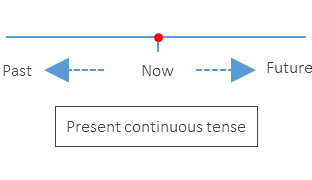 Present continuous tense is used to describe an event that is happening at the moment. I am walking in the park. The action of walking is happening right now. In the moment. Not in future. Not in past. The red dot represents the event happening in the present. 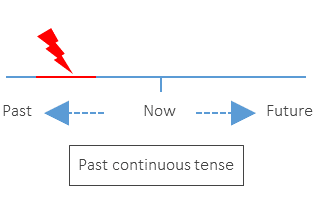 Past continuous tense is used to describe an action that was going on in the past when another event happened. This tense is not used to describe a single action or event. I was walking in the park when someone stole my bike from outside the park. 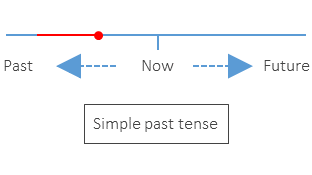 In this example, past continuous tense describes the action of walking that was going on in the past when someone stole the bike (another event). The red line above represents the action (walking) that was going on in the past when another event (bike stolen) – represented by lightening in red – happened. 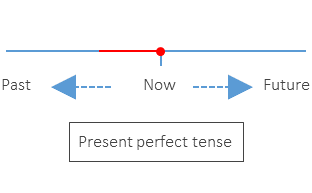 Present perfect tense describes an action that started in the past, continued in the present, and now finished. I have walked in the park for 30 minutes. 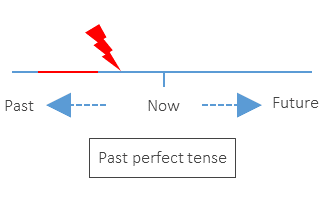 Past perfect tense describes an action you completed in the past before another event took place. I had walked in the park when the rain arrived. Here, the action of walking finished before rain, another event, arrived. That’s why the action of walking has been described by past perfect tense and the event (rain) by simple past tense. The red line represents the action of walking which happened before the rain arrived (represented by lightening). 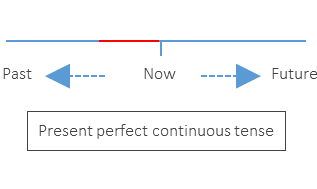 Present perfect continuous tense describes an action that started in the past and is continuing in the present. I have been walking in the park for the past 30 minutes. Here, the action of walking started in the past (30 minutes back) and is still continuing (haven’t stopped walking). If you noticed, we used three different forms of the verb ‘walk’ in the section on tenses. Other verbs too have three forms, which may follow a pattern different from that of ‘walk’, confusing beginners. If you don’t know the three forms for at least the common verbs, you can’t make sentences in tenses such as simple past (where you use past form) and all the perfect tenses (where you use past participle form). Depending on how past and past participle forms are formed from the present form, a verb can be classified as regular or irregular. The past and part participle forms of a regular verb are formed by adding -ed to the verb. Just memorize them. Good part is that there aren’t too many commonly used verbs. This is a common mistake among beginners. Subject and verb in a sentence should be in agreement with each other. Before we come to the two key rules of subject-verb agreement, let’s briefly look at what subject is (we know what verb is). Subject in a sentence is the person or thing that performs the action of the verb. It may be noun, pronoun, or a combination of words. In case of doubt, ask the question ‘who did this’ or ‘what did this’. The answer will be the subject. He fell down from the bike. The cop nabbed the thief after a hot chase. Abhishek goes for a morning jog on weekdays, but plays cricket on Sunday. When the subject is singular, the verb must be singular. And when the subject is plural, the verb must be plural. However, use plural verb when the subject is ‘I’ or ‘you’. Rohan easily runs 10 kilometers in 90 minutes. Rohan and Sanjay run 5 kilometers every Sunday. I easily run two kilometers without stopping for a breath. Rohan easily run 10 kilometers in 90 minutes. Rohan and Sanjay runs 5 kilometers every Sunday. Although there are other rules on subject-verb agreement, the above rule will serve your purpose for most cases while speaking.